WIN: A double pass to Madonna’s Rebel Heart Tour! *Open to New Zealand residents. James Bay will be performing at the Auckland Town Hall tomorrow night (Tuesday 9th Feb). 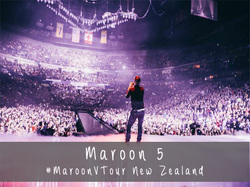 Get Excited New Zealand – Maroon 5 is Coming! Copyright George Stephens 2015. Maroon V Tour - Auckland, New Zealand. Maroon 5 - 3rd October 2015. (Auckland, New Zealand). I attended Maroon 5's first Auckland Concert right here in New Zealand just over a week ago now. Adam Levine had the crowd in his hands as he sang some of their greatest hits from "Sunday Morning" to "This Love", "Maps" and "Sugar". Maroon 5 performed a great show to a sold out concert at Vector Arena, Auckland - New Zealand and I can actually say I sung my lungs out that night. Only thing I so wished they could've brought was their walk-out stage and backdrop that was pictured in Maroon 5's latest music video "This Summer's Is Gonna Hurt" and was used on their American leg of their Maroon V World Tour. The opening acts too were nothing too flash to rave about. But the wait was defiantly worth it to see Maroon 5 perform LIVE! Photos by George Stephens (2015).